ازآنجایی‌که الگوی توزیع برش پایه در ارتفاع در کدهای لرزه‌ای مانند استاندارد 2800 ویرایش 4 بر مبنای رفتار خطی و بدون توجه به نوع زلزله اعمالی است، بنابراین انتظار می‌رود نیروی تراز طبقات تحت اثر زلزله‌های دور و نزدیک گسل در خلال رفتار غیرخطی با الگوی توزیع آیین‌نامه‌ای متفاوت باشد که این تفاوت در توزیع مقاومت و سختی تأثیرگذار است. در مطالعات پیشین تأثیر زلزله‌های حوزه نزدیک بر نیروی تراز طبقات کمتر موردتوجه واقع‌شده است درحالی‌که ارتعاش پالسی شکل توأم با پریود بلند، دامنه بزرگ و مدت دوام کوتاه از فاکتورهای اساسی زلزله نزدیک بوده و می‌تواند بر الگوی بار واقعی مؤثر باشد. ازاین‌رو در این تحقیق با استفاده از تحلیل تاریخچه زمانی غیرخطی 4 مدل سازه‌ای 4، 8، 12 و 18 طبقه با سیستم قاب خمشی فولادی تحت اثر دودسته نگاشت زلزله (20 رکورد زلزله دور و 20 رکورد زلزله نزدیک گسل) متوسط الگوی بار واقعی، در دو سطح زلزله طرح و محتمل موردمحاسبه ‌قرار داده شده است. ضمناً سازه 8 طبقه در برابر الگوی بار واقعی بازطراحی گردید. نتایج در حوزه فرضیات این تحقیق نشان می‌دهند که الگوی توزیع بار واقعی با الگوی ارائه‌شده در استاندارد 2800 زلزله ایران متفاوت است. این تفاوت به نوع زلزله، ارتفاع سازه و سطح خطر زلزله وابسته است. در طبقات پایین و بالای سازه به دلیل تأثیر مودها بالاتر وP- Δ الگوی بار واقعی بزرگ‌تر از مقدار آیین‌نامه و در بخش‌های میانی الگوی بار آیین‌نامه‌ای محافظه‌کارانه و دست بالاست. برای زلزله‌های دور اثر مودهای بالاتر و در زلزله‌های نزدیک اثر P- Δ منشأ اصلی این اختلاف هستند. ضمناً بازطراحی سازه نشان داد بسته به نوع زلزله و سطح خطر انتخابی استفاده از الگوی واقعی می‌تواند پارامترهایی همچون نسبت تنش، وزن المان‌ها و دریفت غیرخطی را در قسمت‌های فوقانی و تحتانی نسبت به الگوی آیین‌نامه‌ای تغییر دهد. Since the lateral load pattern along the height proposed in seismic codes such as standard 2800-4th has been developed on the basis of elastic behavior without paying attention to the type of earthquake, it seems the story lateral force under near and far fault motions during inelastic behavior differ from the code load pattern. This difference affects the distribution of strength and stiffness. In the previous studies, less attention has been paid to the effect of a near fault earthquake on the story load pattern, although pulse type vibrations with long period, large amplitude and short duration are important key parameters and may affect the load pattern. Therefore, in this study the exact load pattern has been assessed for four steel moment frames with 4, 8, 12 and 18 stories under two sets of earthquakes (20 near and 20 far fault motions) and two earthquake hazard level (DBE and MCE). Moreover, the 8-story model has been redesigned with the exact load patterns. Based on this study assumption, results show that exact load pattern differs from what has been proposed by standard 2800. This difference depends on earthquake type, hazard level and the height of the structure. In lower and upper stories, exact load pattern is larger than the code value due to the higher mode and P-delta effects. However, for the middle part, the code load pattern is conservative. For the far fault motions higher mode effects and for the near fault earthquakes, the P-delta effects are the main source of aforementioned differences. Furthermore, the result of redesigned 8-story models shows that depending on the earthquake type and hazard level, using exact load pattern can change parameters such as stress ratio, element weights and inelastic drifts at the lower and upper parts in comparison with the code based load pattern. Code 2800.; “Iranian code of practice for seismic resistant design of buildings”; Third Revision, Building and Housing Research Center, Iran (in persian) (2015).
. Chopra, A. K. (2001), Dynamic of Structures: Theory and applications to earthquake engineering, 2nd edition, Prentice Hall Inc. London.
. Lee, S. S. and Goel, S. C. (2001). Performance based seismic design of structures using target drift and yield mechanism, US-Japan Seminar on Advanced stability and Seismicity Concept for Performance Based Design of Steel and Composite Structures, Kyoto, Japan.
. Deguchi, Y. Kawashima, T. Yamanari, M. and Ogawa, K. (2008), Seismic design load distribution in steel frame, 14th World Conference on Earthquake Engineering, Beijing, China. Moghaddam, H. Hosseini Gelekolai, S. M. Hajirasouliha, I. and Tajali, F. (2012), Evaluation of various proposed lateral load patterns for seismic design of steel moment resisting frames, 15th World Conference on Earthquake Engineering, September 24-28, 2012, Lisbon, Portugal. Zahiri-Hashemi, R. Kheyroddin, A. (2014). Effect of inelastic behavior on the code-based seismic lateral force pattern of buckling restrained braced frames, Arabian Journal for Science and Engineering, 39(12), pp. 8525-8536. FEMA (2000); Prestandard and commentary for the seismic rehabilitation of buildings, FEMA 356. Washington (DC): Federal Emergency Management Agency. Gerami, M. Abdolahzadeh, D. (2015). Vulnerability of steel moment-resisting frames under effects of forward directivity, Struct. Design Tall Spec. Build. 24(2), pp.97–122. Gerami, M. Siahpolo, N. and Vahdani, Reza. (2015). Consideration of higher modes and MDOF effects on strength reduction factor of elastoplastic structures under ordinary and near-fault ground motions: modification factors. 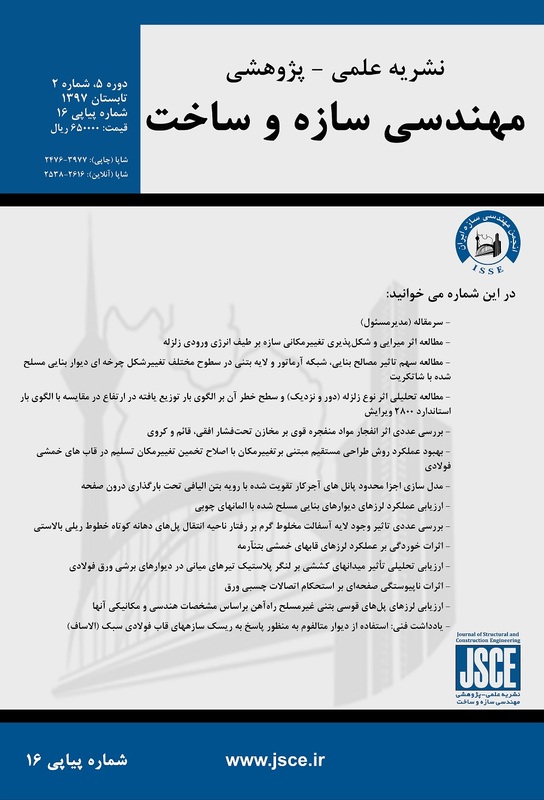 Ain Shams Eng J, http://dx.doi.org/10.1016/j.asej.2015.08.015. Computers and Structures, Inc. Etabs2015 (Ver. 15.0.0)—extended 3D analysis of building systems, nonlinear, Berkeley, California 94704, USA. ANSI/AISC 360-10. Specification for structural steel buildings. American Institute of Steel Construction, INC, Chicago, Illinois 60601-1802; 2010. McKenna, F. and Fenves, G. Open System for Earthquake Engineering Simulation. University of California, Berkeley. http://opensees.berkeley.edu, 2000. Gupta, A. and Krawinkler, H.; “Seismic demands for the performance evaluation of steel moment resisting frame structures”; Stanford University (1999).